Global smart thermostats market expected to reach USD 7,904.4 million by 2024, growing at a CAGR of around 29.5% between 2018 and 2024. Smart thermostats help users to change several thermostat settings from their smartphone and, in some cases, a computer and web browser or with user’s voice using a device such as the Amazon Echo. The report covers forecast and analysis for the smart thermostats market on a global and regional level. The study provides historical data from 2015 to 2017 along with a forecast from 2018 to 2024 based on revenue (USD Million). The study includes drivers and restraints for the smart thermostats market along with the impact they have on the demand over the forecast period. Additionally, the report includes the study of opportunities available in the smart thermostats market on a global level. The report gives a transparent view of the smart thermostats market. We have included a detailed competitive situation and portfolio of leading vendors that are operative in the smart thermostats market. To understand the competitive state in the smart thermostats market, an analysis of Porter’s Five Forces model for the smart thermostats market has also been covered. 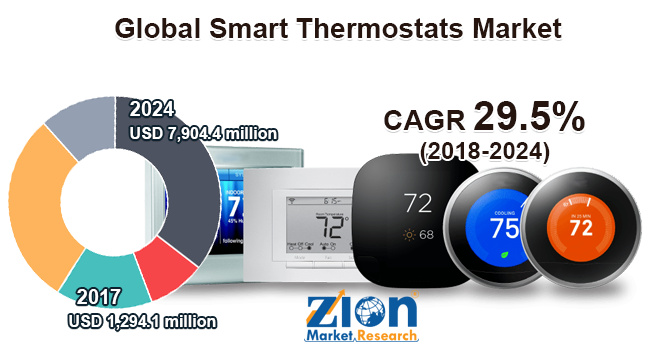 The study also offers a market attractiveness analysis, in which components, network technology, application, and regional segments are marked based on their growth rate, market size, and general attractiveness for smart thermostats market. The study provides a crucial view of the smart thermostats by segmenting the market based on components, network technology, application, and regions. All the application segments of the smart thermostats market have been analyzed based on present and the future trends and the market is estimated from 2018 to 2024. Based on components, global smart thermostats market is fragmented into the display, motion sensor, humidity sensor, temperature sensor, and others. Based on network technology, the smart thermostat market is categorized into wired networking and wireless network. Application segment is classified into industrial, residential, commercial, and others. The regional segmentation comprises the current and forecast demand for the Middle East & Africa, North America, Europe, Latin America, and the Asia Pacific with its further bifurcation into major countries including the U.S., France, the UK, Germany, China, India, Japan, and Brazil. The competitive profiling of key players of smart thermostats market includes a company overview and financial overview, business strategies adopted by them and their recent developments, a product offered by them which can help in assessing competition in the smart thermostats market. Key players included in the report are Schneider Electric, Ecobee, Inc., Tado GmbH, Nest Labs, Inc., Emerson Electric Co., Control4 Corporation, Ingersoll Rand Plc, Nortek, Inc., Honeywell International Inc., and Carrier Corporation, amongst others.